Phototherapy, also known as LILT, soft laser, cold laser or light therapy, can utilise either small LED laser devices or high intensity Super Luminescent Diodes (SLDs). Although often but incorrectly generically referred to as ‘Laser’, our applicators utilise very high intensity focussed SLD red and blue emitters. From our own research the Biomag 2 and FFU units both can be set to 1400Hz. This frequency was found to be the most effective frequency for both the stimulation of epithelial sub-dermal cellular proliferation and the reduction of scar tissue. The Blue Imita has an antibacterial effect that helps reduce infection around open and healing wounds. The Westville Therapy Red Pen Emitter is small and very handy to carry around and use. It features a single high-intensity red SLD and is designed to plug directly into either the Biomag 2 or the FFU. It comes with 2 metres of high quality cable with an XLR plug to fit. It is 130mm long (excluding the cable) and 14.5mm wide. The images below show the iMita Pens SLD entering a turbid medium . This turbid medium is slightly more translucent than biological tissue but it serves to show a pattern of absorption. Absorption by true Lasers show a remarkedly similar pattern for the same wavelengths. We have introduced a new phototherapy pen offering an ultraviolet wavelength of around 390nm. These are ideal for using against acute bacterial infections in hard to access places. Also available to order is an infrared version of the above pens. These have an 880nm emitter. 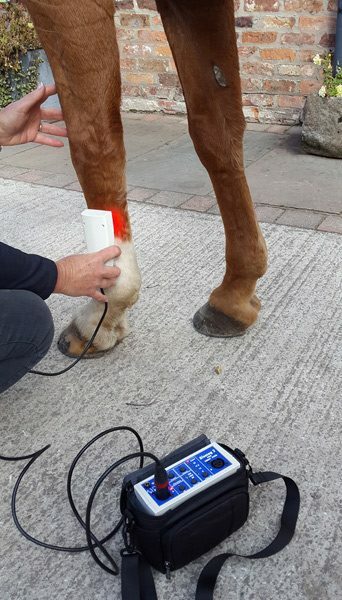 The Imita 30 (VR) has 30 high intensity visible red emitters for healing of wounds and scar reduction, but has also proved useful for deeper tendon injuries. The unit has also a single pulsed coil with individual switch control. This allows the option of additional PMF treatment to be offered simultaneously. 30 off red (631nm) emitters. The Imita 30 (B) has 30 high intensity blue emitters. It is designed specifically for application to infected wounds due to its antibacterial effect. As with the above applicator, a single field coil is included and can be used simultaneously to the Phototherapy if required. 30 off blue (469nm) emitters. Both of the above units should be used set to 1400Hz, which has been identified from our research as having the optimum effect. However, if the pulsed coil is to be used at the same time, settings should be adjusted to a lower frequency of 50 or 200 Hz. Caution: Do Not Stare Into The Beam! Available to order is an infrared version of the Imita. It has 30 emitters of 880nm along with the pmft coil built in as with the others above. Did you know? ...that depending upon wavelength, that for 880nm infrared, the power output of any phototherapy/laser device is absorbed and reduced down to 1% at a depth of only 8 - 10mm into tissue. This is under ideal conditions for application and absorption. Even by doubling the power of the beam the depth of absorption down to the 1% level will only increase by about 1mm. Doubling the power yet again and so on does not guarantee a greater ability to get deep into tissue. (Research by Hode et al using 880nm and backed up by Baxter et al). However, other mechanisms may allow for a cascade effect deeper into tissue. Pulsing phototherapy beams is also suggested by Hode et al to reduce surface turbidity. It may increase the effective depth that the beam can reach. Westville phototherapy applicators are pulsed and have sufficient power to reach sub-dermal tissue under ideal access to the skin conditions. This helps in stimulating localised blood flow, pain relief, anti-bacterial effects and promoting natural healing processes.